← Do You Understand Your Publishing Contract? Today’s review is from Ameica’s history of prohibition and the age of the Great Depression. Bootlegging is a flourishing business and speakeasies were plentiful. 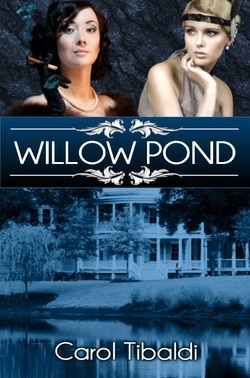 In Willow Pond, by Carol Tibaldi, we see the dark side of this history rather than the glorification. Victoria Kingsley is a successful and powerful speakeasy owner and rubs elbows with the criminal element of the day. She has one relationship that means more to her than any, that with her niece, Laura. Laura’s baby son is kidnapped and it throws her into a turmoil and fearing that the local authorities are incompetent, she sets out to find the culprit and bring the baby home. Due to Laura’s ex-husband’s high public profile due to his movie star status, this is a high publicized case and Laura develops a relationship with the reporter handling the case over the course of the investigation. That is all the description I can give without giving away too much of the story. My take: This is an interesting story that starts a bit slowly. Some of the characters are developed very well and others are left lacking. Virginia is an interesting character that is loving and has an edginess to her. She is smart and capable. The husband, Phillip is not a likable fellow. He is a vain, pompous, and a philanderer to the extreme. Laura is the most under developed character. She could be so much more but we see her as a hand-wringing devastated mother at one point, then in a very short time span, she is finding comfort in another man’s arms during the investigation. Then she is emotionally unavailable to him. She is very inconsistent and not too believable especially for what she is going through. Although I really wanted to like this story, this is a major character, and I couldn’t muster up much sympathy for either her or her ex–husband. Although I can’t say why without giving up a spoiler, Virginia also loses sympathy as well with some of her actions..so I end up left cold. The ending seemed too contrived and slapped together, but by this time, I wasn’t really caring too much to be honest. I think this book has too many problems for me to be able to recommend it. This entry was tagged Carol Tibaldi, Great Depression, historical fiction, kidnapping, mystery, Reviews, romance, Willow Pond. Bookmark the permalink.